Fanning the flames of the GoT hype, Actress Carice van Houten visited Seth Meyers’ late night NBC talk show to promote the upcoming sixth season of HBO fantasy drama, “Game of Thrones”. 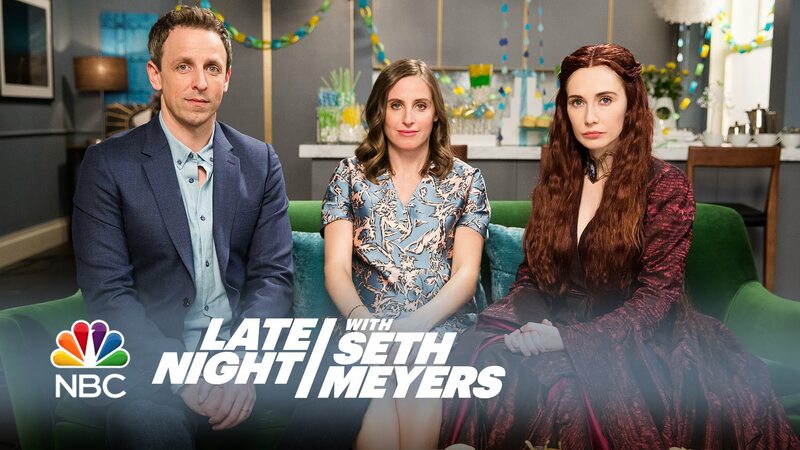 Watch how Melisandre conducts herself during a baby shower in a new sketch from Late Night with Seth Meyers as she teases Jon Snow’s fate without revealing any spoilers. Clearly The Red Woman is concerned about Alexi and her friends as she warns them on multiple occasions “The night is dark and full of terrors” and did you see that rattle? Form & function is what it is! AND made from Valyrian Steel? Talk about quality! With some encouragement from Seth, Melisandre tries to bond with the group as she opens up about her romantic interests and her amazing display of fireworks! Next articleEmpire Magazine pays homage to Marvel’s Civil War with new cover spotlighting Captain America: Civil War!